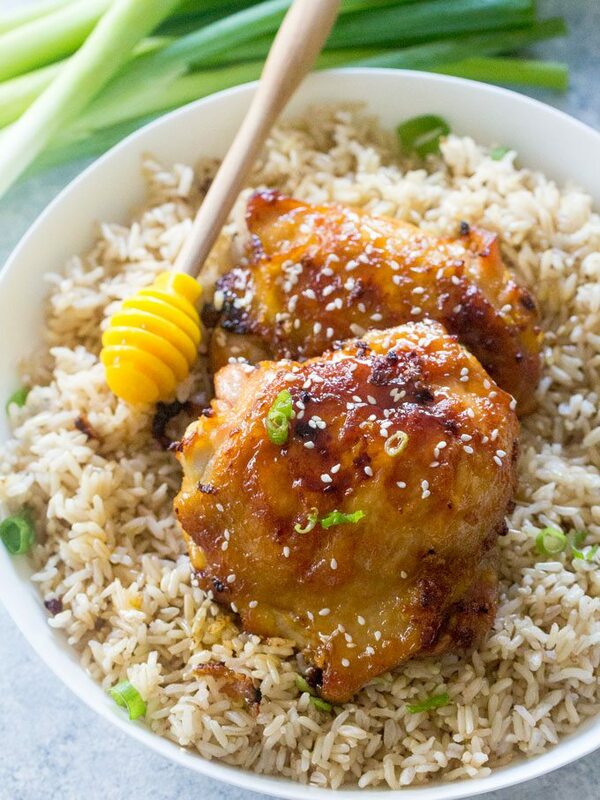 Honey Garlic Mustard Chicken made with just 6 ingredients and in one pan only, makes weeknight dinners easy, delicious and budget friendly. 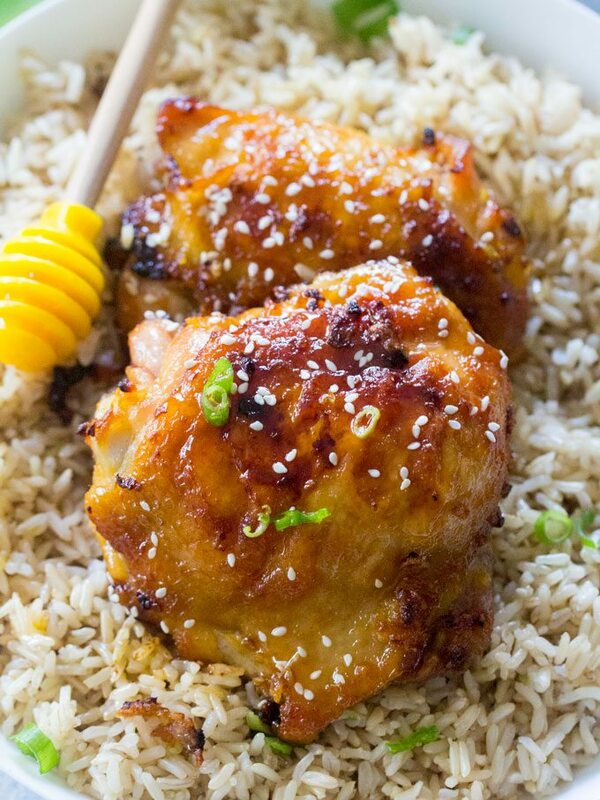 We love making easy and delicious chicken meals for the family to enjoy. 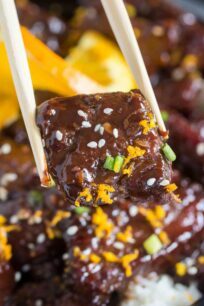 Among our most popular chicken dishes are Instant Pot Orange Chicken, Slow Cooker Garlic Sesame Chicken and One Pan Italian Chicken. 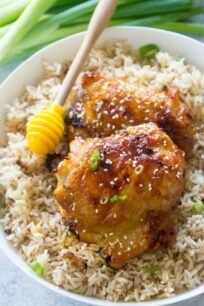 Honey Garlic Mustard Chicken is such an easy and quick dinner that you will be making it over and over again. 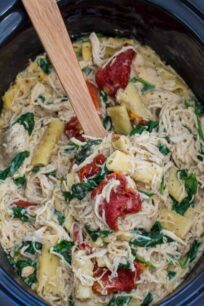 I like easy recipes with just a few ingredients so I don’t have to fuss much over a weeknight dinner. 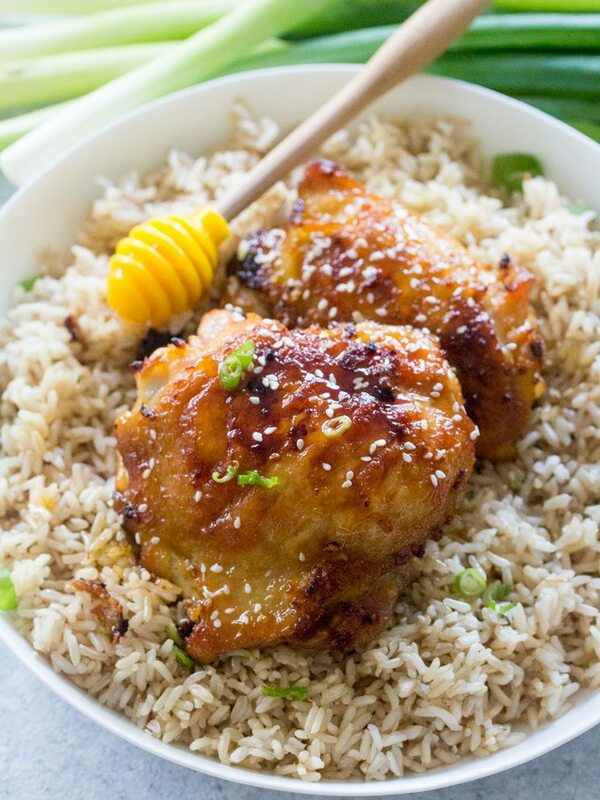 This Honey Garlic Mustard Chicken is made with just 6 ingredients, including the chicken! 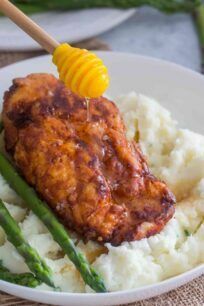 Juicy, flavorful and the perfect combination of sweet and savory the chicken is great served with rice or a big salad. 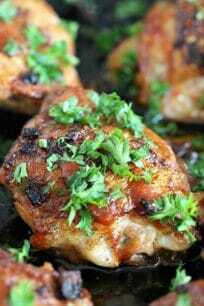 First, I like making this dish with chicken thighs, but it works great with chicken breasts too. Also, you can add less garlic if you want, I personally love garlicky meals, so the more the merrier! 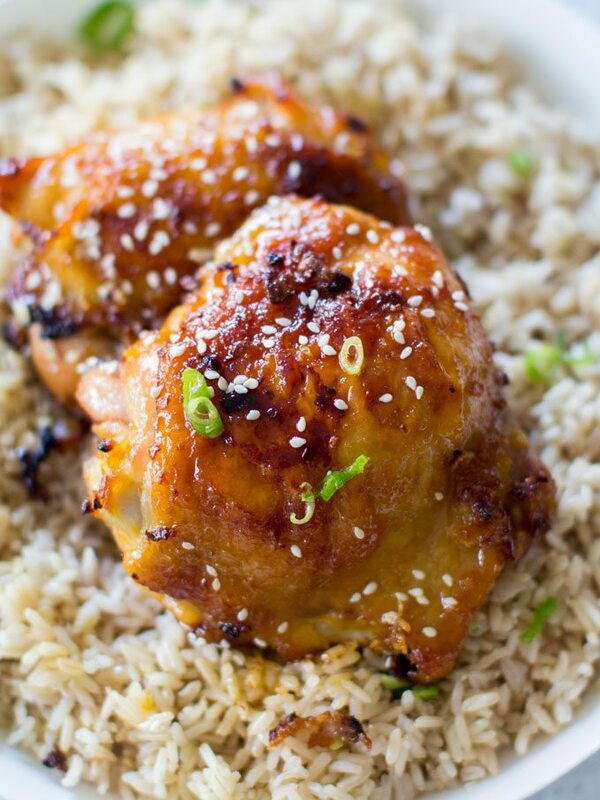 For a spicier kick, add 1-2 teaspoons of red pepper flakes and even some hot sauce. In addition, try not to replace the fresh garlic with powder garlic. Yes you can. First, sear the chicken to brown it, set the aside, cover with foil. Add the rice to the pan, and do NOT add the chicken. Follow the directions for the sauce. Transfer the rice to the oven and cook the rice covered for 25 minutes. After that add the chicken breast on top and cook for another 20 minutes. Add the sauce on top of the chicken and enjoy. Sheet Pan – I love, love this pan! Its durable and non-stick! 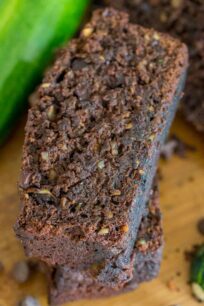 Mustard Powder – great flavor, I like using it a lot. 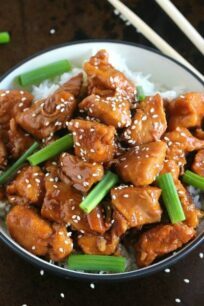 In a large bowl, combine all the ingredients except chicken and mix. Place the chicken onto a baking pan, pour any excess sauce over the chicken. Bake for 30 - 40 minutes on the bottom rack of your oven or until the chicken is golden brown. I’m with you: the more garlic the better! 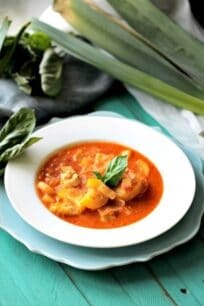 This is a great dish – can’t wait to try this recipe! 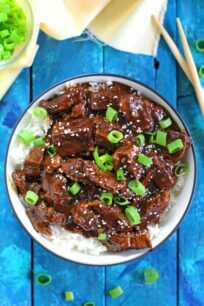 Saving this for those nights I need an easy and delicious meal! Thanks for sharing! Love how quick & easy this is! 🙂 Perfect for busy weeknights. 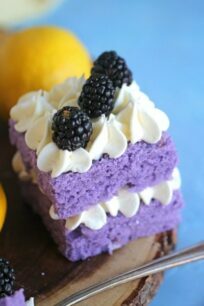 I love that I have everything already to make this dish! Saves me time going to the store while getting dinner on the table faster, thanks!